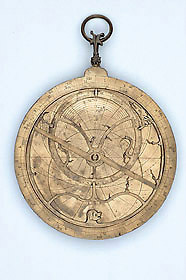 The rete of this astrolabe closely resembles those illustrated in manuscripts of Geoffrey Chaucer's Treatise on the Astrolabe, written in 1391. Of particular interest is the pointer for Sirius or the 'dog-star' fashioned as a dog's head. Another star, Vega, can be found close to the centre represented as a little bird. Whether this is a deliberate reference to its Arabic name, which means 'falling vulture', is less certain.